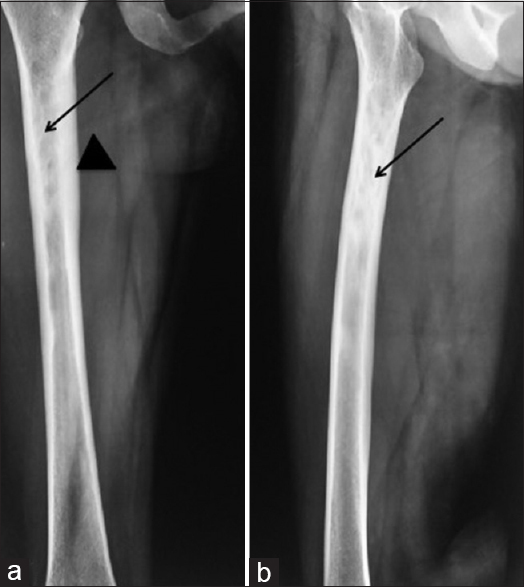 Objective: Femoral head avascular necrosis (FHAVN) is one of the increasingly common causes of musculoskeletal disability and poses a major diagnostic and therapeutic challenge. Although radiography, scintigraphy, computed tomography (CT), and magnetic resonance imaging (MRI) have been widely used in the diagnosis of FHAVN, positron emission tomography (PET) has recently been evaluated to assess vascularity of the femoral head. In this study, the authors compared F-18 fluoride PET/CT with MRI in the initial diagnosis of FHAVN. Patients and Methods: We prospectively studied 51 consecutive patients with a high clinical suspicion of FHAVN. All patients underwent MRI and F-18 fluoride PET/CT, the time interval between the two scans being 4-10 (mean 8) days. Two nuclear medicine physicians blinded to the MRI report read the PET/CT scans. Clinical assessment was also done. Final diagnoses were made by surgical pathology or clinical and radiologic follow-up. Results: A final diagnosis of avascular necrosis (AVN) was made in 40 patients. MRI was 96.5% sensitive, 100% specific, and 98.03% accurate while PET/CT was 100% sensitive, specific, and accurate in diagnosing FHAVN. The agreement between the two imaging modalities for the diagnosis of AVN was 96.07%. Conclusion: F-18 fluoride PET/CT showed good agreement with MRI in the initial diagnosis of FHAVN and can be better than MRI in detecting early disease. Objective: In the surgery of breast cancer, axillary reverse mapping (ARM) is the identification and preservation of arm draining lymph node (ARM node) during an axillary dissection. The assumption is that the ARM node is different from node draining breast and is unlikely to be involved even in the patients with axillary nodal metastases. If we can identify and preserve ARM node using lymphoscintigraphy; morbidity of lymphedema, as seen with axillary dissection, may be avoided. Materials and Methods: Pathologically proven 50 breast cancer patients undergoing initial surgery (cTx-4, cN0-2, and Mx-0) were included in this study. Less than 37 MBq, 0.5 ml in equally divided doses of filtered 99mTc sulfur colloid was injected intradermally into the second and third web spaces. ARM nodes in the axilla were identified with the help of Gamma Probe intraoperatively; however, their location was noted with the reference to specific anatomical landmarks and sent for histopathological examination after excision. Results: The ARM node was successfully identified in 47/50 cases (sensitivity - 94%). 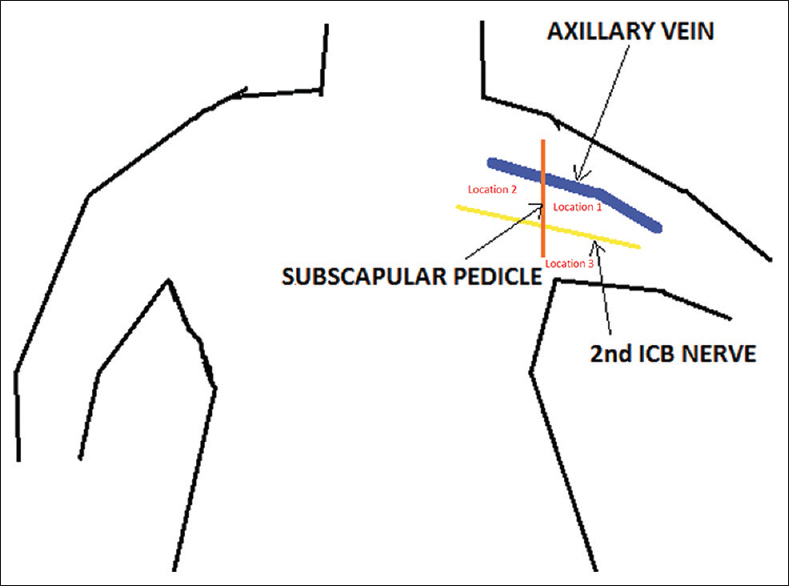 In 40 out of 47 cases (85%), the location of the ARM node was found to lateral to the subscapular pedicle, above the second intercostobrachial nerve and just below the axillary vein. Of the 47 patients in whom ARM node/s were identified, metastasis was noted in 5 of them (10%). Four out of these 5 patients had the pN3 disease. Conclusion: ARM node exists, and it is feasible to identify ARM node using radio isotope technique with an excellent sensitivity. ARM node seems to have a fairly constant location in more than 80% cases. It is involved with metastasis (10% cases) only when there are multiple lymph nodal metastases in the axilla. Aims and Objectives: To assess the diagnostic utility of contrast-enhanced 18 F-fluorodeoxyglucose positron emission tomography-computed tomography (FDG PET-ceCT) in localization of tumors in patients with clinical diagnosis of tumor-induced osteomalacia (TIO), in correlation with histopathological results. Materials and Methods: Eight patients (five male and three female) aged 24-60 (mean 42) years with a clinical diagnosis of TIO were included in this prospective study. They underwent whole body (head to toe) FDG PET-ceCT following a standard protocol on Philips GEMINI TF PET-CT scanner. The FDG PET-ceCT results were correlated with postoperative histology findings and clinical follow-up. Results: All the patients had an abnormal PET-ceCT study. The sensitivity of PET-ceCT was 87.5%, and positive predictive value was 100%. The tumor was located in the craniofacial region in 6/8 patients and in bone in 2/8 patients. Hemangiopericytoma was the most common reported histology. All patients underwent surgery, following which they demonstrated clinical improvement. However, one patient with atypical findings on histology did not show any clinical improvement, hence, underwent 68 Gallium-DOTANOC PET-ceCT scan for relocalization of the site of the tumor. Conclusion: The tumors causing TIO are small in size and usually located in obscure sites in the body. Hence, head to toe protocol should be followed for FDG PET-ceCT scans with the inclusion of upper limbs. Once the tumor is localized, regional magnetic resonance imaging can be performed for better characterization of soft tissue lesion. Imaging with FDG PET-ceCT plays an important role in detecting the site of the tumor and thereby facilitating timely management. Purpose: The role of 18 fluorodeoxyglucose positron emission tomography (PET) is limited for detection of primary hepatocellular carcinoma (HCC) due to low contrast to the tumor, and normal hepatocytes (background). The aim of the present study was to improve the contrast between the tumor and background by standardizing the input parameters of a digital contrast enhancement technique. Materials and Methods: A transverse slice of PET image was adjusted for the best possible contrast, and saved in JPEG 2000 format. We processed this image with a contrast enhancement technique using 847 possible combinations of input parameters (threshold "m" and slope "e"). The input parameters which resulted in an image having a high value of 2 nd order entropy, and edge content, and low value of absolute mean brightness error, and saturation evaluation metrics, were considered as standardized input parameters. The same process was repeated for total nine PET-computed tomography studies, thus analyzing 7623 images. Results: The selected digital contrast enhancement technique increased the contrast between the HCC tumor and background. In seven out of nine images, the standardized input parameters "m" had values between 150 and 160, and for other two images values were 138 and 175, respectively. The value of slope "e" was 4 in 4 images, 3 in 3 images and 1 in 2 images. It was found that it is important to optimize the input parameters for the best possible contrast for each image; a particular value was not sufficient for all the HCC images. Conclusion: The use of above digital contrast enhancement technique improves the tumor to background ratio in PET images of HCC and appears to be useful. Further clinical validation of this finding is warranted. Introduction: Positron emission tomography has been established as an important imaging modality in the management of patients, especially in oncology. The higher gamma radiation energy of positron-emitting isotopes poses an additional radiation safety problem. Those working with this modality may likely to receive higher whole body doses than those working only in conventional nuclear medicine. The radiation exposure to the personnel occurs in dispensing the dose, administration of activity, patient positioning, and while removing the intravenous (i.v.) cannula. 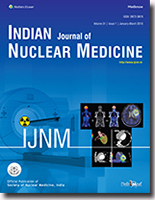 The estimation of radiation dose to Nuclear Medicine Physician (NMP) involved during administration of activity to the patient and technical staff assisting in these procedures in a positron emission tomography/computed tomography (PET/CT) facility was carried out. Materials and Methods: An i.v access was secured for the patient by putting the cannula and blood sugar was monitored. The activity was then dispensed and measured in the dose calibrator and administered to the patient by NMP. Personnel doses received by NMP and technical staff were measured using electronic pocket dosimeter. The radiation exposure levels at various working locations were assessed with the help of gamma survey meter. Results and Discussion: The radiation level at working distance while administering the radioactivity was found to be 106-170 μSv/h with a mean value of 126.5 ± 14.88 μSv/h which was reduced to 4.2-14.2 μSv/h with a mean value of 7.16 ± 2.29 μSv/h with introduction of L-bench for administration of radioactivity. This shows a mean exposure level reduction of 94.45 ± 1.03%. The radiation level at working distance, while removing the i.v. cannula postscanning was found to be 25-70 μSv/h with a mean value of 37.4 ± 13.16 μSv/h which was reduced to 1.0-5.0 μSv/h with a mean value of 2.77 ± 1.3 μSv/h with introduction of L-bench for removal of i.v cannula. This shows a mean exposure level reduction of 92.85 ± 1.78%. Conclusion: This study shows that good radiation practices are very helpful in reducing the personnel radiation doses. Use of radiation protection devices such as L-bench reduces exposure significantly. PET/CT staff members must use their personnel monitors diligently and should do so in a consistent manner so that comparisons of their doses are meaningful from one monitoring period to the next. Purpose of the Study: This study conducted a review on nuclear medicine (NM) services in Mazandaran Province with a view to establish adult diagnostic reference levels (DRLs) and provide updated data on population radiation exposure resulting from diagnostic NM procedures. Materials and Methods: The data were collected from all centers in all cities of Mazandaran Province in the North of Iran from March 2014 to February 2015. The 75 th percentile of the distribution and the average administered activity (AAA) were calculated and the average effective dose per examination, collective effective dose to the population and annual effective dose per capita were estimated using dose conversion factors. The gathered data were analyzed via SPSS (version 18) software using descriptive statistics. Results: Based on the data of this study, the collective effective dose was 95.628 manSv, leading to a mean effective dose of 0.03 mSv per capita. 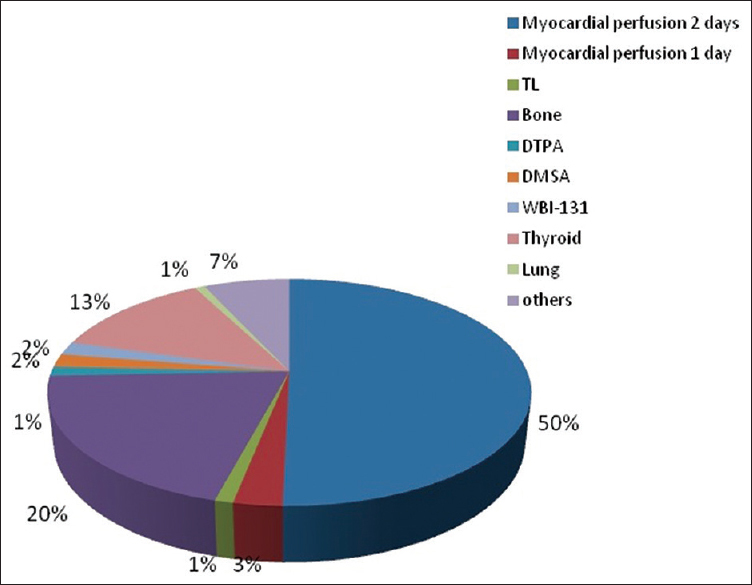 It was also observed that the myocardial perfusion was the most common procedure (50%). The 75 th percentile of the distribution of administered activity (AA) represents the DRL. The AAA and the 75 th percentile of the distribution of AA are slightly higher than DRL of most European countries. Conclusions: Myocardial perfusion is responsible for most of the collective effective dose and it is better to establish national DRLs for myocardial perfusion and review some DRL values through the participation of NM specialists in the future. Parathyroid adenomas are usually small in size; (weighing 70 mg-1 g) those weighing more than 2-3 g are classified as giant parathyroid adenomas. Giant parathyroid adenomas are in fact rarely encountered among patients with primary hyperparathyroidism. They are believed to have distinct clinical and biochemical features related to specific genomic alterations. We chanced to manage a unique and possibly the first case of giant parathyroid adenoma (6 cm diameter and weighing 20 g) presenting with recurrent episodes of pancreatitis and discuss its surgical management with an added emphasis on the role of nuclear imaging in its preoperative localization. Our case demonstrates that clinicians should have a high index of suspicion of primary hyperparathyroidism in patients presenting with recurrent episodes of pancreatitis. Timely diagnosis, appropriate preoperative localization techniques, which would include a parathyroid scintigraphy and a focused surgical intervention are crucial to resolve complications and improve outcomes. 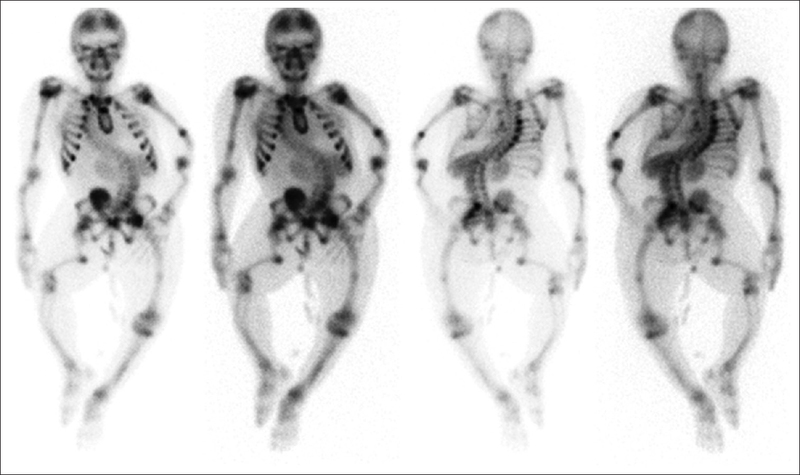 Sclerotic bone dysplasias are diagnosed based on clinical and radiological features; however, in some instances pose a dilemma. We herewith report a case of a 38-year-old female who presented with right lower extremity pain, and was detected to have sclerotic diaphyseal lesion on X-ray. Triphasic 99mTc methylene diphosphonate (MDP) Bone scan helped in confirming the diagnosis of intramedullary osteosclerosis, a dysplastic bone disorder. 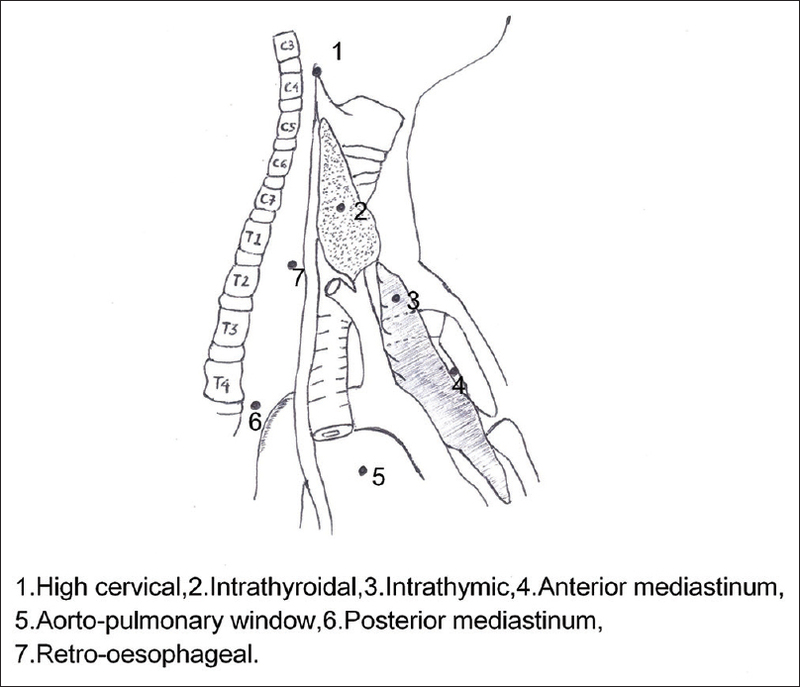 A 65-year-old patient, with a history of left hemi-thyroidectomy for adenomatous goiter 20 years previously, was found to have pulmonary lesions on chest X-ray, a brain lesion on computerized tomography (CT), and elevated serum thyroglobulin (Tg). While completion thyroidectomy revealed that no pathological evidence of thyroid malignancy, radioiodine-avid pulmonary, brain, and renal and bone lesions were identified on diagnostic as well as posttherapy whole body planar scintigraphy and single photon emission computed tomography-CT. Subsequent ultrasonography-guided biopsy of a renal nodule showed thyroid follicular cells. This case suggests that metastatic differentiated thyroid carcinoma should be suspected in asymptomatic patients with incidentally detected lesions, raised serum Tg, and history of thyroid lesions. 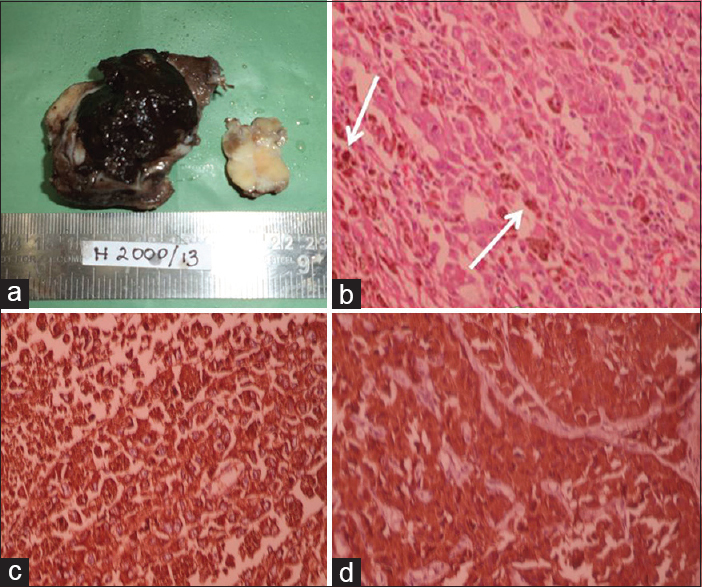 The authors report an extremely rare occurrence of a massive tumor thrombus involving right internal and external jugular veins extending into superior vena cava from a still rarer melanotic medullary carcinoma thyroid in the postoperative follow-up. The case was managed by hypofractionated intensity modulated radiotherapy technique with gratifying results. Primary hyperparathyroidism is caused by parathyroid adenomas in 85% of the cases. Since parathyroid adenomas are known for their ectopic location, presurgical localization of the suspected site of adenoma is desirable. However, current imaging modalities are not always successful in localizing ectopic parathyroid adenomas. 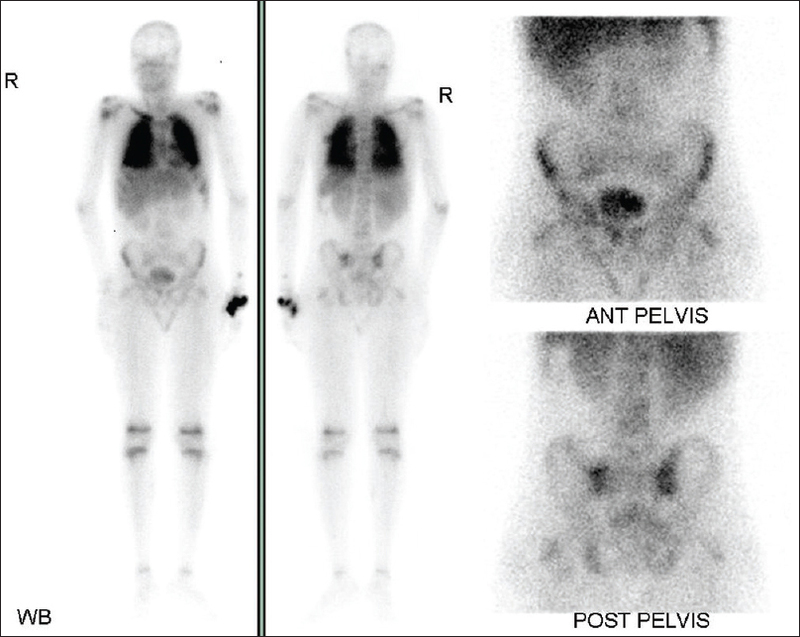 The aim of this case report is to show that 11 C-methionine positron emission tomography could accurately localize ectopic parathyroid adenomas in patients in whom conventional imaging had failed or is inconclusive. Primary adrenal lymphoma (PAL) is a rare malignancy often involving bilateral adrenal glands. Diffuse large B-cell is the most common histological type. Unilateral presentation and T-cell/natural killer (T/NK) cell histological type is rarer. We report fluorine-18 fluorodeoxyglucose positron emission tomography/computed tomography scan findings in a case of unilateral T/NK cell PAL performed for staging and interim treatment response assessment. Anaplastic large cell lymphoma (ALCL) is a rare type of nonHodgkin's lymphoma (NHL), but one of the most common subtypes of T-cell lymphoma. It is an aggressive T-cell lymphoma, and some ALCL may mimic less aggressive classical HL histopathlogically. It may be misdiagnosed unless careful immunohistochemical examination is performed. As the prognosis and management of these two lymphomas vary significantly, it is important to make a correct diagnosis. We describe a case who was diagnosed as classical HL by histopathological examination of cervical lymph node, in whom 18 F-flouro deoxyglucose positron emission tomography/computed tomography appearances were unusual for HL and warranted review of histopathology that revealed anaplastic lymphoma kinase-1 negative anaplastic large T-cell lymphoma, Hodgkin-like variant, thereby changing the management. 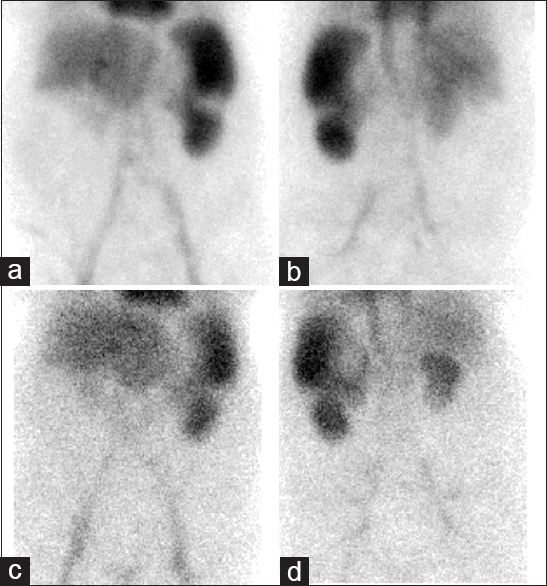 Positron emission tomography/computed tomography (PET/CT) using 2-deoxy-2-(fluorine-18) fluoro-D-glucose ( 18 F-FDG) has become a standard diagnostic modality in oncological practice. F18-FDG PET/CT is sensitive in detecting malignancy; however, specificity is low in differentiating infections or inflammatory diseases from tumor. In the present case study, we report a patient with postoperative carcinoma of tongue presenting with cervical lymphadenopathy and fever. The PET/CT scan showed metabolically active generalized lymphadenopathy, and a possibility of lymphoma was suggested. Fine needle aspiration cytology showed the Ziehl-Neelsen staining to be strongly positive for acid-fast bacilli and first line of antitubercular drug was administrated. Six months later after the initiation of therapy, a follow-up PET/CT showed remarkable improvement of the disease status. 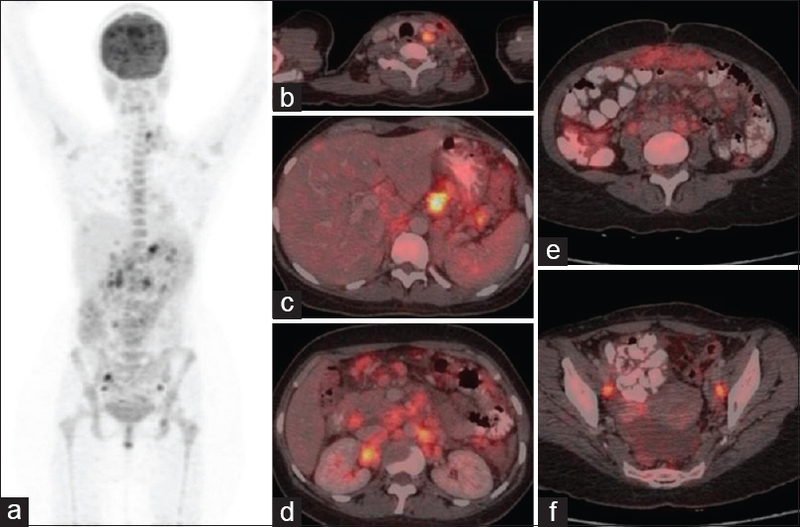 This case study illustrates that tubercular infection can be a pitfall in F18-FDG PET/CT imaging. PET positive lesions do not always indicate malignancy, and histological confirmation of lesions with biopsy should always be performed. Once diagnosed to be tubercular, FDG PET/CT is a powerful imaging tool in monitoring the therapy. We report the fluorodeoxyglucose positron emission tomography/ computed tomography (FDG - PET/CT) findings in an 11-month-old boy with suspected milk protein allergy, presented to the hospital with 2-month history of fever of unknown origin and failure to thrive. It showed FDG avid lymphadenopathy above and below the diaphragm and splenic focus, which could represent diffuse inflammatory process or lymphoma. Subsequent jejunal biopsy showed non-necrotizing granulomas. Ulcerative colitis (UC) is an inflammatory bowel disease characterized by waxing and waning inflammation that changes in severity and extent and may progress to neoplasia, especially in the presence of strictures. When patients have nonnegotiable strictures or severe inflammation with ulcers, colonoscopy is difficult and carries the risk of perforation. 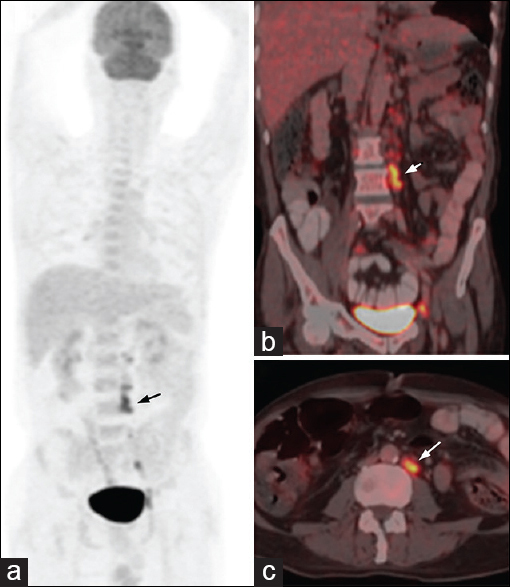 The authors present a patient with pan-UC with multiple strictures, in whom fluorodeoxyglucose positron emission tomography/computed tomography was used to noninvasively evaluate the extent and severity of the disease. We report a case of 18-year-old boy who presented with vomiting, backache, and fever for 1-month, diagnosed to have anaplastic large cell lymphoma of urinary bladder with hypercalcemia and metastatic calcification in multiple viscera. His computed tomography scan was suggestive of soft tissue lesion in the urinary bladder and multiple lytic skeletal lesions. Bone scan showed unusual visceral uptake in lungs, liver, spleen, and myocardium in addition to osseous lesions. The clinical laboratory test revealed functional impairment of visceral organs. The patient died 3 months later. A thirty-year-old male underwent Tc-99m diethylenetriaminepentaacetic acid renal scintigraphy for evaluation of gross hydronephrosis of left kidney. The perfusion phase revealed an intense vascular blush in left renal fossa. 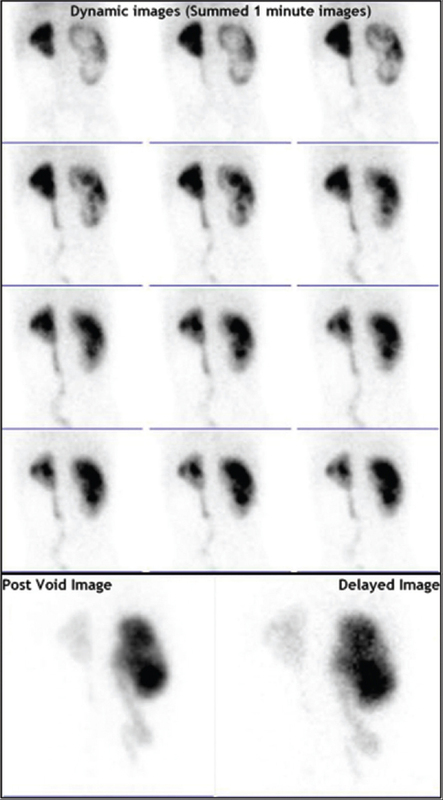 The uptake phase of scintigraphy revealed the absence of tracer uptake in left kidney. Contrast-enhanced computed tomography (CECT) was performed for evaluating the cause of vascular blush. CECT demonstrated features suggestive of acute pyelonephritis (APN) involving lower pole of the hydronephrotic left kidney, corresponding to the site of vascular blush seen on renal scintigraphy. The postnephrectomy specimen confirmed the diagnosis of APN suggested on CECT. Patient with a history of overt gastrointestinal bleeding, diabetes mellitus, hypertension, polycythemia vera, and choledocojejunostomy was hospitalized because of hematemesis and melena. An area of Technetium-99m labeled red blood cells accumulation at the splenic flexure similar to an overt bleeding area, was observed on gastrointestinal bleeding scintigraphy (GIBS). In case of underlying malignancy, abdominal computed tomography was performed and demonstrated the infarction area placed laterally in spleen, appearing as a cold region on sctintigraphic image, separating the inferomedial and upper part of splenic uptake. Splenic variants and pathologies can complicate interpretation of GIBS. 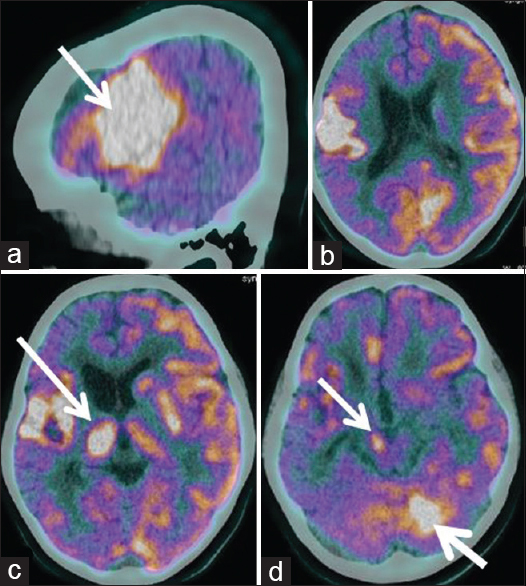 The present case highlights the utility of ictal F-18 fluorodeoxyglucose (FDG) positron emission tomography (PET)/computed tomography (CT) in delineating the seizure onset zone in a child with complex partial seizures. Although F-18 FDG PET has been successfully used to delineate interictal hypometabolism, planned ictal FDG PET, in cases with prolonged seizure activity, can provide better spatial resolution than single-photon emission CT by delineating the seizure onset zone and propagation pathway. Positron emission tomography-computed tomography (PET/CT) is a routine investigation for the staging of lymphomas. Contrast-enhanced computed tomography is mandatory whenever parenchymal lesions, especially in the liver and spleen are suspected. 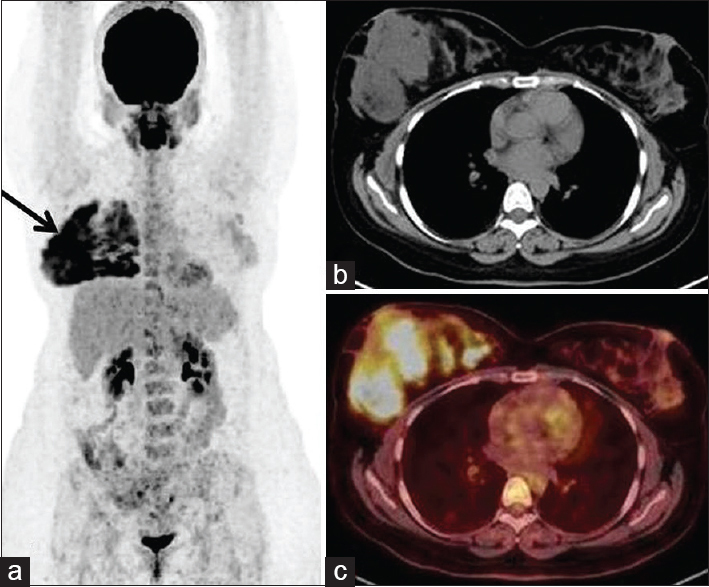 We report a rare case of primary mediastinal T-cell lymphoma evaluated with contrast-enhanced PET/CT that showed features of superior vena cava syndrome. A 37-year-old male patient presented with right knee pain and swelling. The patient had a 6-year history of rheumatoid arthritis. Physical examination was notable for swelling and tenderness of the right knee. The diagnosis of lipoma arborescens (LA) was confirmed from the magnetic resonance imaging of the right knee. 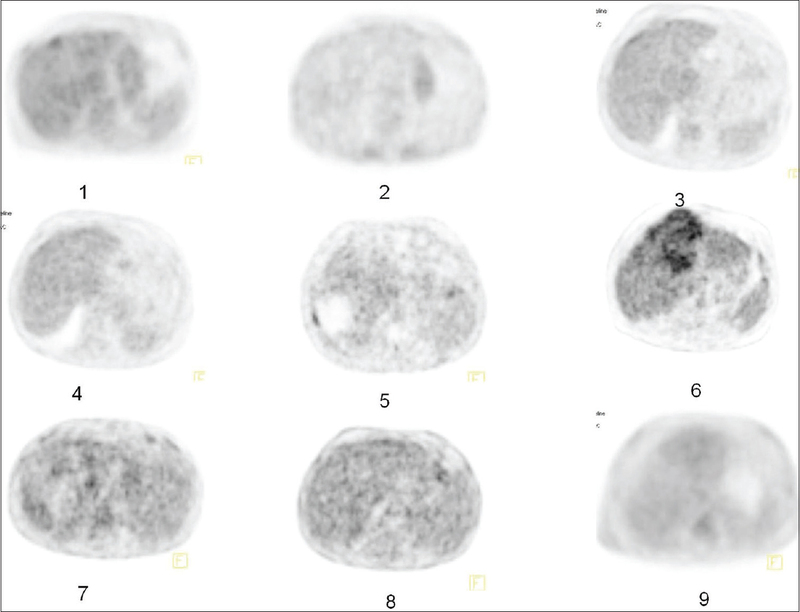 Herein, we report the use of bone scintigraphy in a case of LA treated with yttrium-90 radiosynovectomy. The present case highlights the importance of history taking in solving the dilemmas of variant F-18 FDG uptake on PET/CT. Asymmetrically increased, abnormal looking, FDG uptake in the right breast of our patient was related to her breast feeding practice. Because of personal preference the patient suckled her child from the right breast only. This resulted in asymmetry of size, increase in glandular breast parenchyma and FDG uptake in the breast that was suckled.